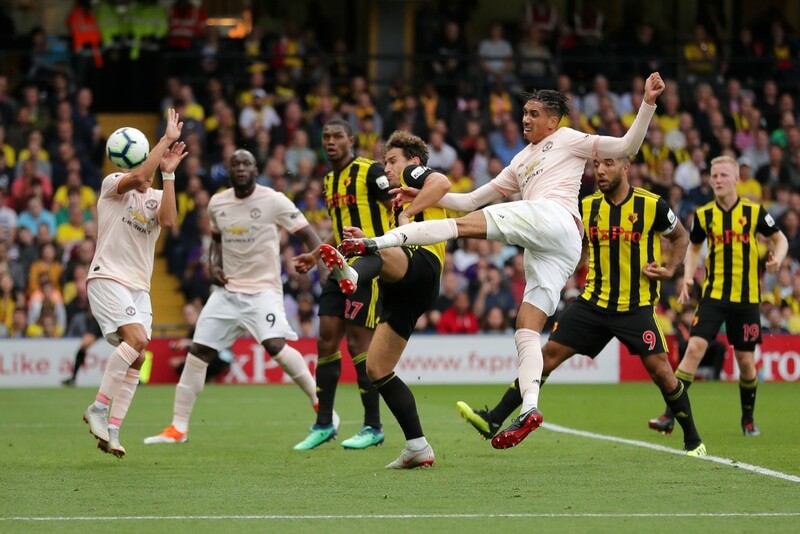 Manchester United registered their third win of the season, bringing an end to Watford’s winning run, courtesy goals from Romelu Lukaku and Chris Smalling. 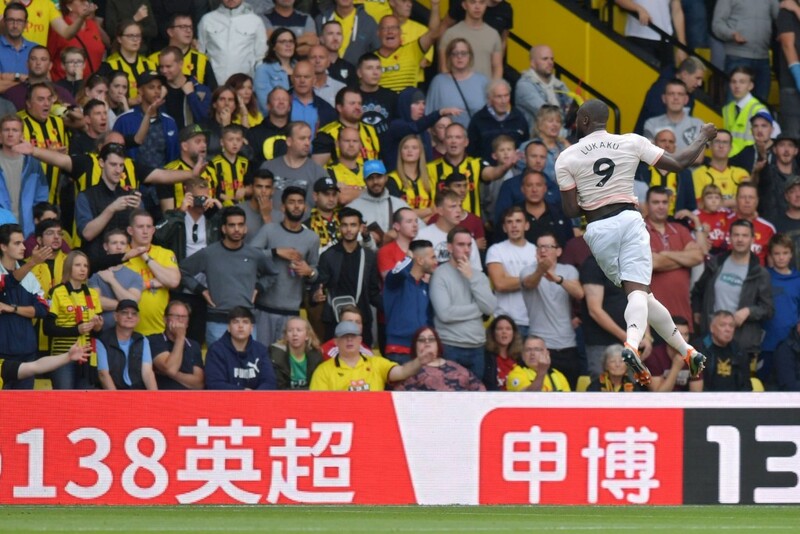 Manchester United continued their resurgence as they beat Javi Gracia’s Watford 2-1 at Vicarage Road, in gameweek five of the 2018-19 Premier League season on Saturday. 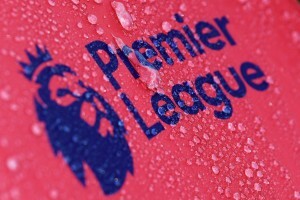 Coming into the game on the back of a solid win against Burnley, Jose Mourinho’s men meant business straight away and posed a few problems for the Hornets before star striker Romelu Lukaku opened the scoring in the 35th minute, deflecting an Ashley Young cross into the net with his torso. Three minutes later, United went two up as Chris Smalling finished stunningly, chesting the ball before powerfully volleying it home from close range. Watford came back with more purpose after the break and record signing Andre Gray halved the deficit. But, the Red Devils held on, despite Nemanja Matic’s sending off, to become the first team to take points from Vicarage Road this term. In the process, Watford’s 100 percent win record was brought to a halt, while Manchester United moved up to eighth spot in the Premier League standings. Here’s how the Red Devils’ stars performed in their second away win of the season. Made a solid stop to deny Troy Deeney in the first period with the scoreline still at 0-0, allowing United to establish their stronghold. Had little else to do until he pulled off another brilliant save to keep Christian Kabasele’s goal-bound effort out in the dying embers of the game. Proved his worth to the team again, although he will be disappointed not to come away with a clean sheet. The Manchester United captain was kept on his toes defensively by the dangerous Roberto Pereyra and for most parts did his job well. However, Gray’s goal came from his flank, while he also offered precious little in terms of quality end product in the final third. The England international has firmly established himself as the first-choice centre-half at United and put in another reliable display at the back. Collided head on with Deeney in a physical battle and managed to quell his danger for most parts. His most important contribution, however, was the marvelous strike that proved to be the winning goal. Making his fourth league appearance of the campaign, the Swedish centre-back started decently, keeping things moving with some sharp passing, while coping fairly well with the threat of Deeney and Gray. However, he could have done a little better in the lead up to Watford’s goal. The veteran Englishman made his second start of the season, against his former club and offered a useful outlet for United down the left-flank. His crosses were always a threat and both the Red Devils’ goals originated from his deliveries into the box. Started the game very positively, moving forward with intent and purpose. Kept United ticking with sharp and accurate passing and could have scored a goal himself if not for Ben Foster in the Watford goal. Faded a bit after the break though, and wasn’t as secure in possession. 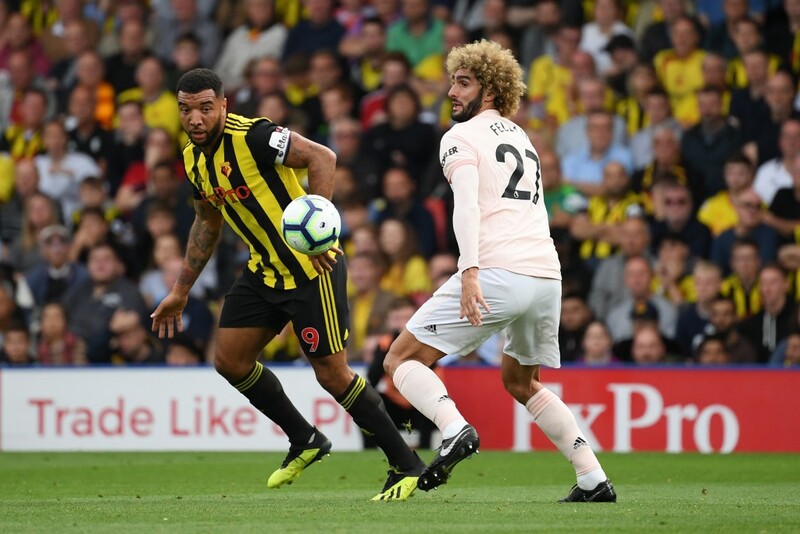 Early clumsiness almost gifted Deeney a goal, but Fellaini grew into the game from thereon. Offered added security in defence against a physical Watford attack, while his presence in the box was pivotal to both of United’s goals. Passing became a bit awry towards the end. Anchored the midfield effectively, was strong in tackles, neat and tidy in possession and made a few key interceptions. Having been booked already, however, he made a poor challenge on Will Hughes to receive his marching orders late in the game. Will be a huge miss against Wolves in the next game. Apart from a brilliant cross to set Pogba up for a chance, the Englishman had little impact in the final third. Worked hard off the ball with his movement opening spaces for others and tracked back well, but not all that effective. The Belgian wasn’t always at his best but made the most of the opportunity that was presented to open the scoring in the first period, taking his tally to four goals from five appearances this season. Held up the ball very well at the top and helped out defensively as well, with Watford turning it on in the final stages of the game. Forced Foster into a sharp stop after going on a fine run, but continues to underwhelm. There were a couple of good looking passes for his teammates, but Sanchez offered little after the break. Looks a shadow of his former self and is struggling to live up to his colossal wages. Replaced Lingard in the 72nd minute, left Mourinho furious after wasting an opportunity to play Lukaku in from a counter. Looked like a player severely short on confidence. Came on for Sanchez with little over five minutes left.